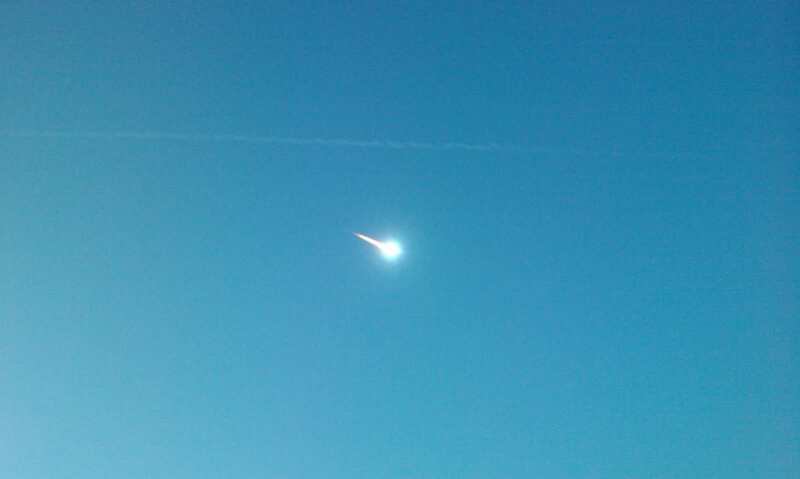 This weekend, Earth passed through a stream of debris from 3200 Phaethon. 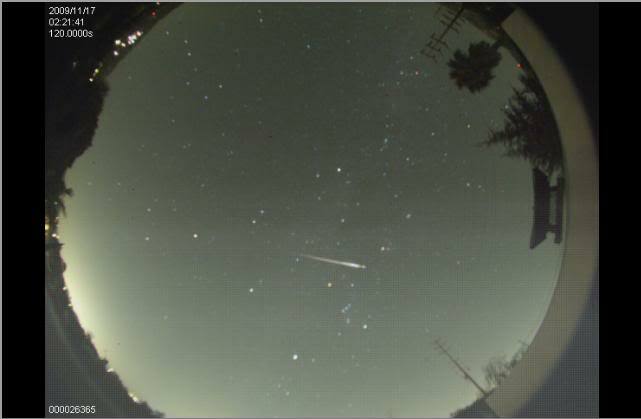 In 1983 Whipple identified Phaethon like the parent of Geminid meteor stream. But it has never displayed unambiguous cometary activity. 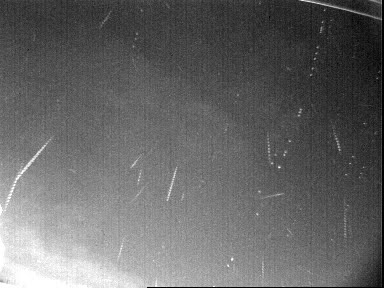 The Geminids provide the most impressive meteor display of any of the annual showers. 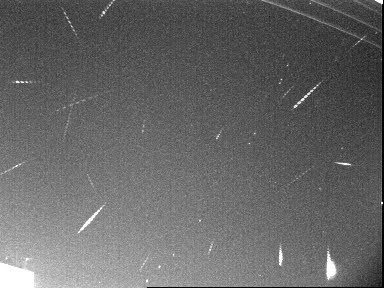 According to IMO Meteor Shower Calendar "the Geminid peak has shown slight signs of variability in its rates and timing in recent years"
The all-sky camera of Cloudbait Observatory (Colorado, Usa) recorded 419 Gemind meteors between sunset on December 9 and sunrise on December 14 (232 on on the peak night of December 13/14). 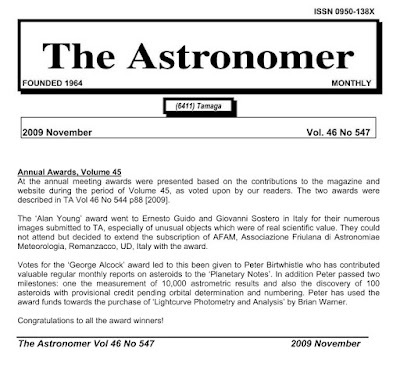 IAU circular No. 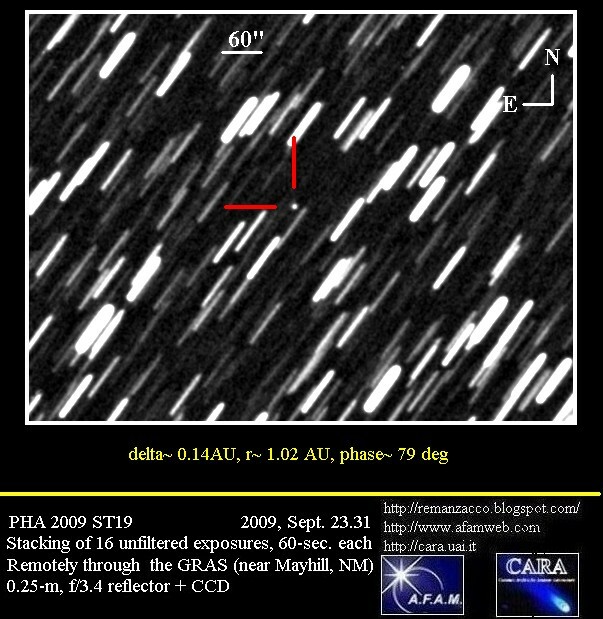 9078, issued on 2009, Sept. 29, announces that an asteroidal object, discovered with a 0.45-m f/2.8 reflector + CCD by the "La Sagra Sky Survey" (Spain), has been reported to show cometary features by several observers, involved in its astrometric follow-up. 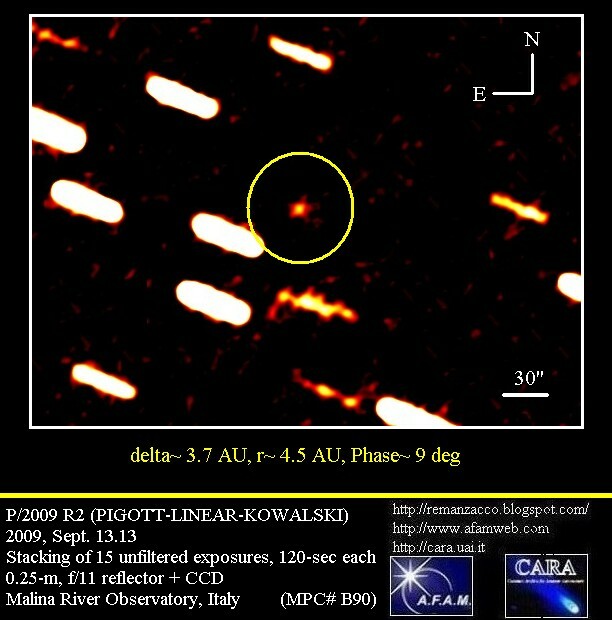 Our attention to this object with a peculiar orbit, has been drawn by one member of the "La Sagra" staff (R. Stoss, 2009 Sept. 10, private communication). Then we planned an observing campaign, asking some help to other fellow observers of the CARA collaboration (namely, P. Bacci, E. Bryssinck and R. Ligustri). 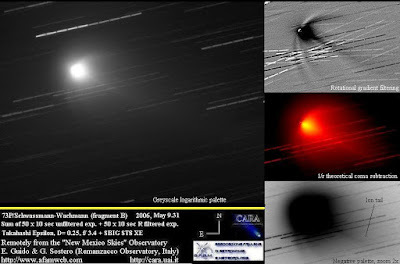 Our first attempt to investigate about the nature of this object, simply failed: the images obtained on 2009, Sept. 14, remotely from the Mayhill Station (NM) of the GRAS network, were of bad quality due to the presence of thin cyrrus clouds. Then, for several nights, bad weather conditions prevented us to perform further follow-up on it. 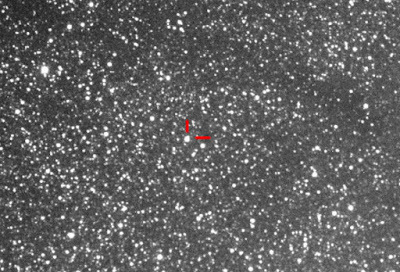 Further confirming observations were performed by other fellow observers we alerted, like the CARA memebers E. Bryssinck (remotely through the Tzec Maun 0.4-m reflector, NM, Sept. 16.3) and R. Ligustri (Talmassons, Italy, 0.35-m reflector; Sept. 19.9), who reported a coma ranging from 10 to 15-arcsec in diameter. Other indipendent positive detections of cometary features on this object were performed by observers operating professional telescopes, like A. F. Tubbiolo and R. S. McMillan (Spacewatch 1.8-m reflector, Sept. 12.3), F. Hormuth (Calar Alto 3.5-m telescope, Sept. 17.9) and G. Muler (2-m Faulkes Telescope North, Sept. 18.4), that described a 10-15-arcsec diffuse coma. 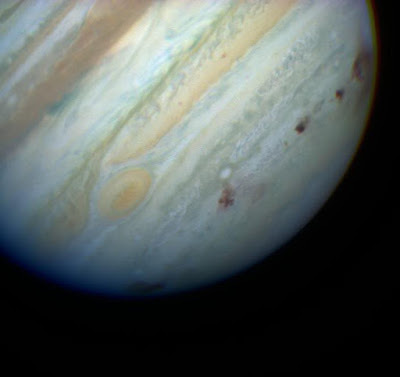 According to the Minor Planet Center's database, this low-activity, Jupiter-family comet, completes a revolution around the Sun every 6.8 years, with a perihelion at about 2.1 Au from our star (that will be reached in Oct. 2009), and an aphelion at 5.0 AU; inclination above the ecliptic plane is about 5 deg. It's future visibility will be complicated by its declining brightness. 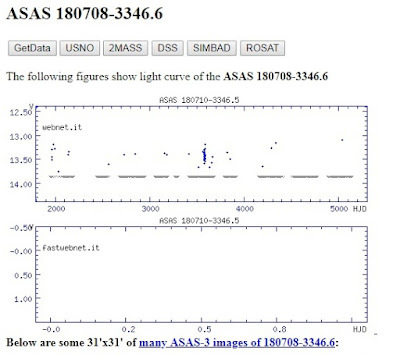 Congratulations to the "La Sagra Sky Survey" team for their discovery. IAUC nr. 9075, issued on 2009 Sept. 24th, announces the discovery of another comet by Robert McNaught, named P/2009 S2. 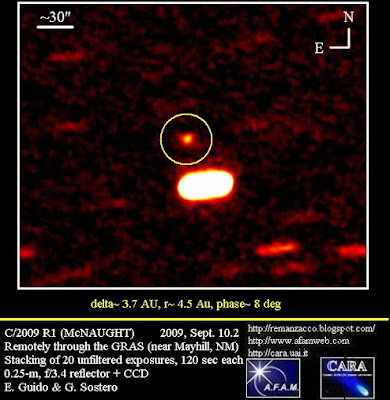 This object has been picked-up by McNaught on 2009, Sept.20.7 in the southern constellation of Fornax, at about magnitude 19. 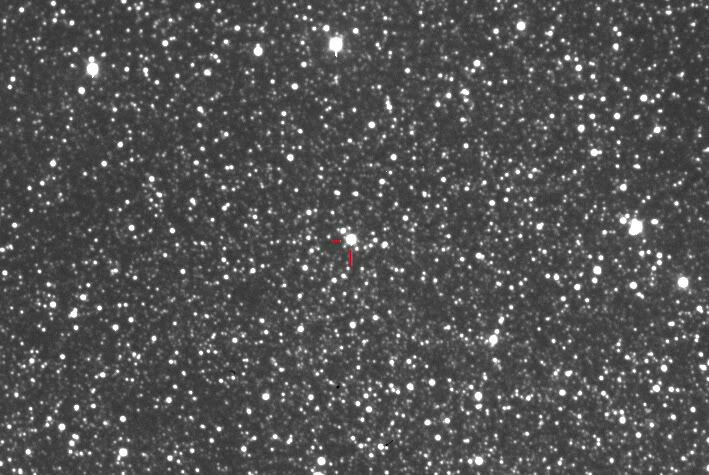 We performed some follow-up of this target remotely on 2009, Sept. 24.36 with a 0.25-m, f/3.4 reflector + CCD (near Mayhill, NM). 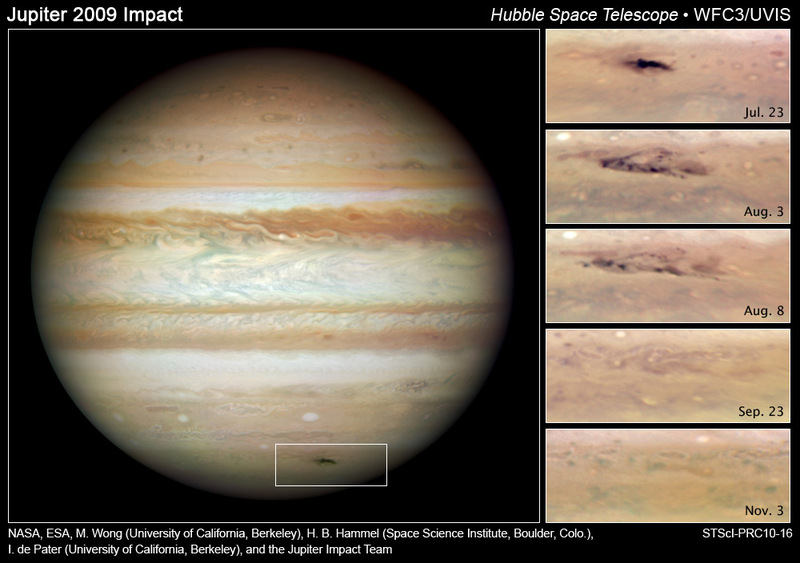 Stacking of 15 unfiltered exposures, 120-seconds each, showed a coma nearly 10" in diameter, remarkably elongated in the same direction of a narrow tail, that was measured to be about 14" long in p.a. 255 deg. 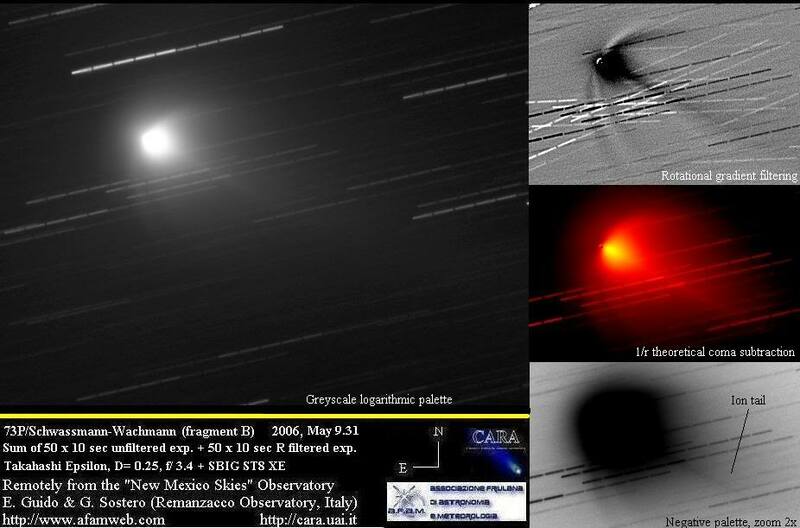 Preliminaty orbital elements and ephemerids of this periodic comet have been published on M.P.E.C. 2009-S90. 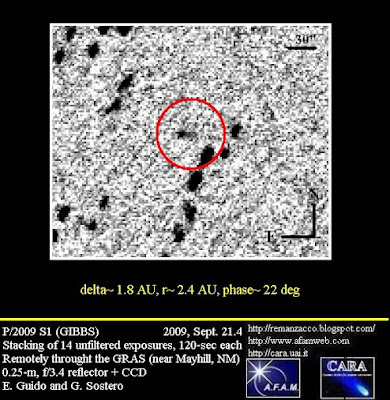 Perihelion has been reached on June, 2009, at about 2.2 AU from the Sun. The orbit has an inclination of 28 degrees and is completed in nearly 8.5 years. 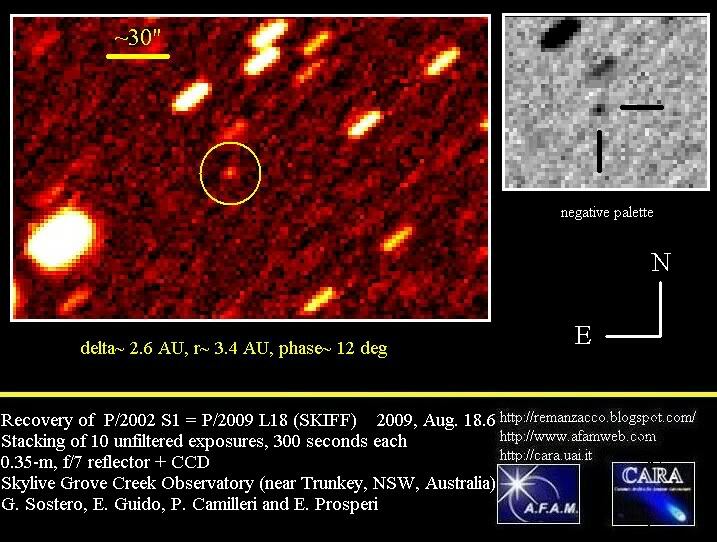 P/2009 S2 will mostly remain a faint southern comet for the rest of the current perihelium passage. This minor planet, belonging to the "Apollo" class, is also flagged as a "Potentially Hazardous Asteroid", an object that, because of its orbital parameters, might represent a possible threat of impact for planet Earth. It has beeen discovered serendipitously by the Spanish amateur astronomer J. M. Bosch (Santa Maria de Montmagastrell, MPC#B74) on 2009, Sept. 16.2, ay magnitude about 17. 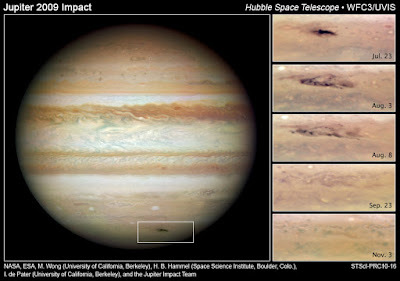 At that time it was posted on the NEO-CP webpage of the Minor Planet Center as "jmbo11"; after a couple of days it was withdrawn, because it was not confirmed by any further observations. 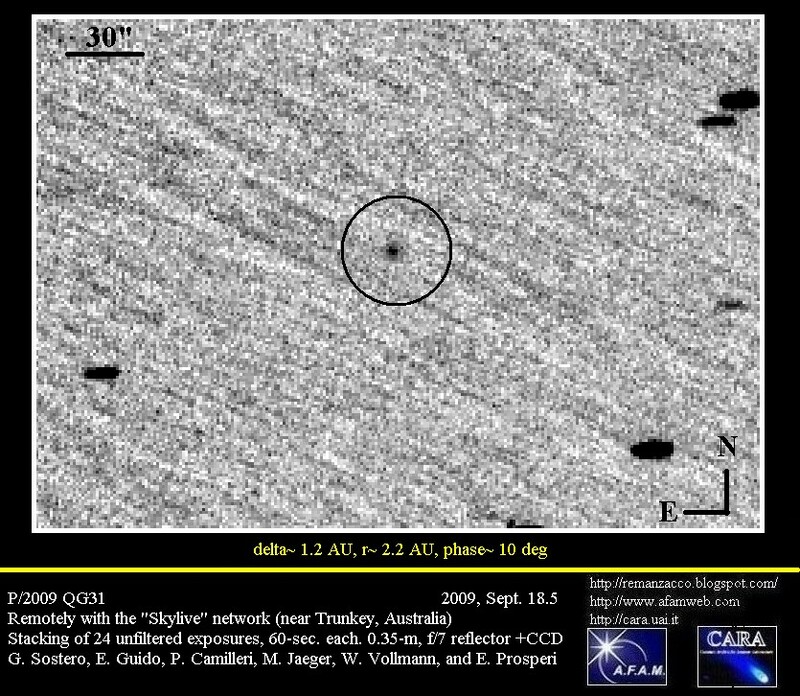 On 2009, Sept. 22, the LINEAR sky survey picked-up a fast moving object, that was posted in the NEO-CP as "BQ24981". 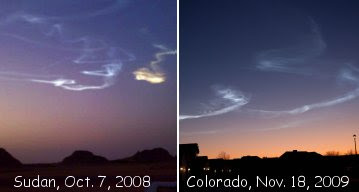 After some follow-up observations from various sites, on 2009 Sept. 23 the MPC published M.P.E.C. 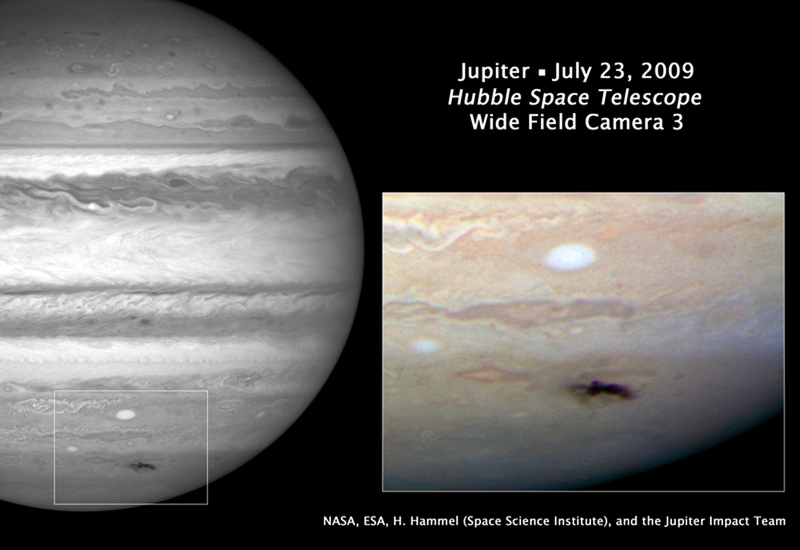 2009-S72 informing that the two objects mentioned before were actually the same celestial body. 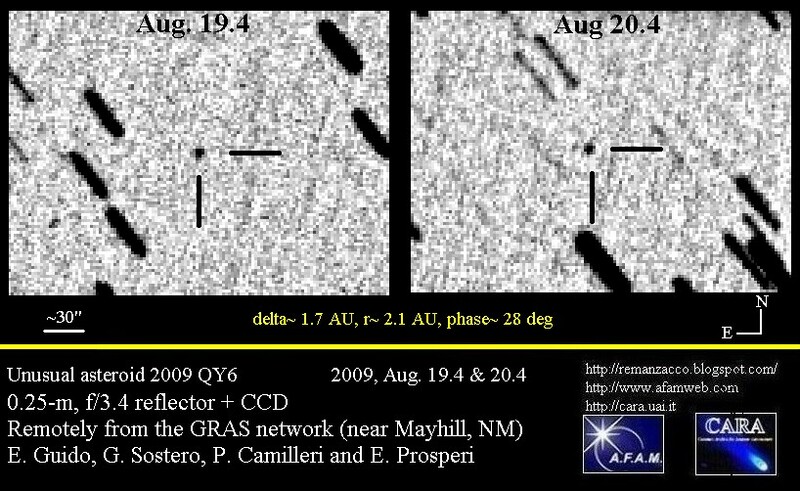 We performed some follow-up of this object on 2009, Sept.23.1, remotely from the Mayhill Station (NM) of the GRAS network. Click on the image below for a bigger version. According to the NEODyS webpage this object. 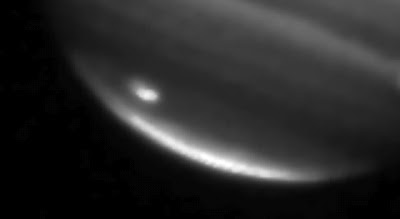 about 0.5-Km in diameter, made a close pass to Earth on 1980, Oct. 4, at a minimum possible distance of about 0.009 AU (nominal distance of about 0.04 AU). Congratulations to J. M. Bosch for his find. 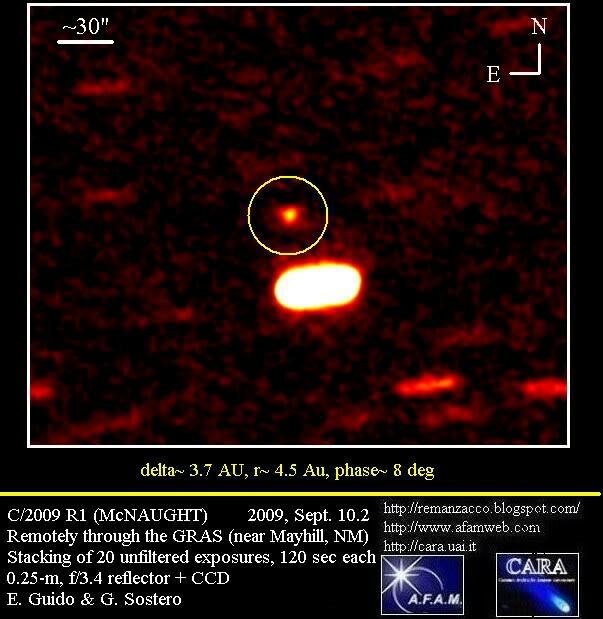 IAU Circular nr. 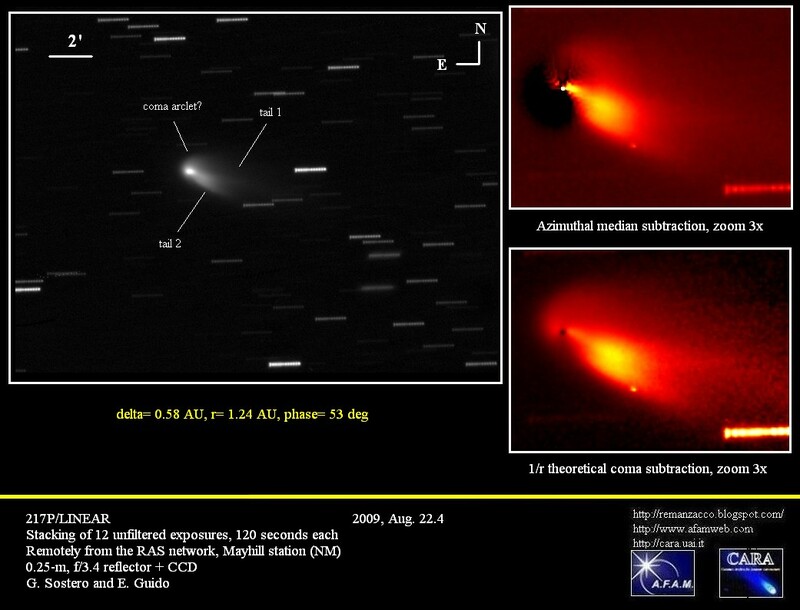 9074 issued on 2009, Sep. 22, announces the discovery of a new comet by A. R. Gibbs, named P/2009 S1 (Gibbs). 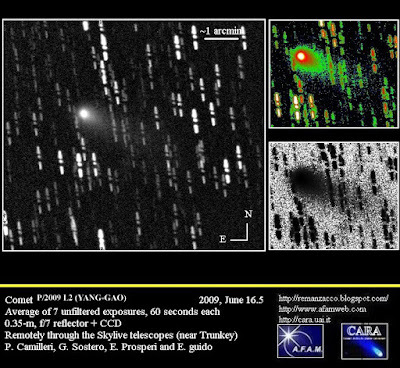 It was found on Sep. 20 in the course of the Catalina Sky Survey with the Catalina 0.68-m Schmidt telescope. After posting on the Minor Planet Center's 'NEOCP' webpage, other observers have noted the cometary appearance of this 18.5 - 19 magnitude object. 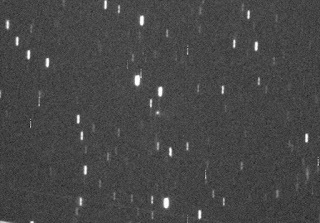 We have been able to confirm this object remotely, through the GRAS network, using a scope located in Mayhill (NM): on 2009, September 21.4, co-adding of 14 unfiltered exposures, 120 seconds each, obtained by means of a 0.25-m, f/3.4 reflector + CCD, show a condensed coma nearly 8" in diameter and a broad tail about 20" long in p.a. 260 deg. 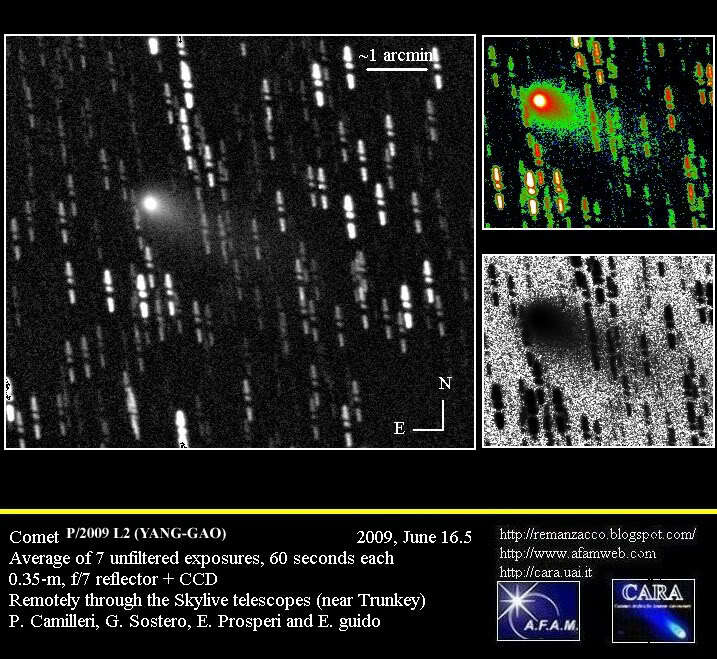 This is the 13th comet discovery for Gibbs. IAUC no. 9072, issued on 2009, Sept. 11, announces the recovery of P/2003 A1 (LINEAR). 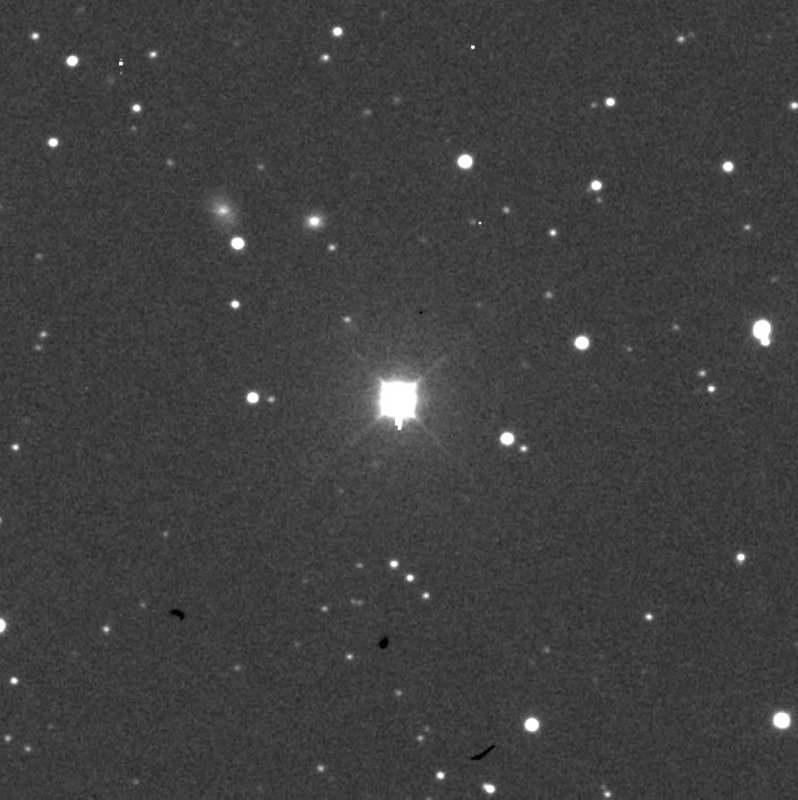 This comet has been initially picked-up as a diffuse object (coma about 15-20 arcsec elongated in PA 280 deg) by R. A. Kowalski with the Catalina 0.68-m Schmidt telescope on 2009, Sept. 10.4. 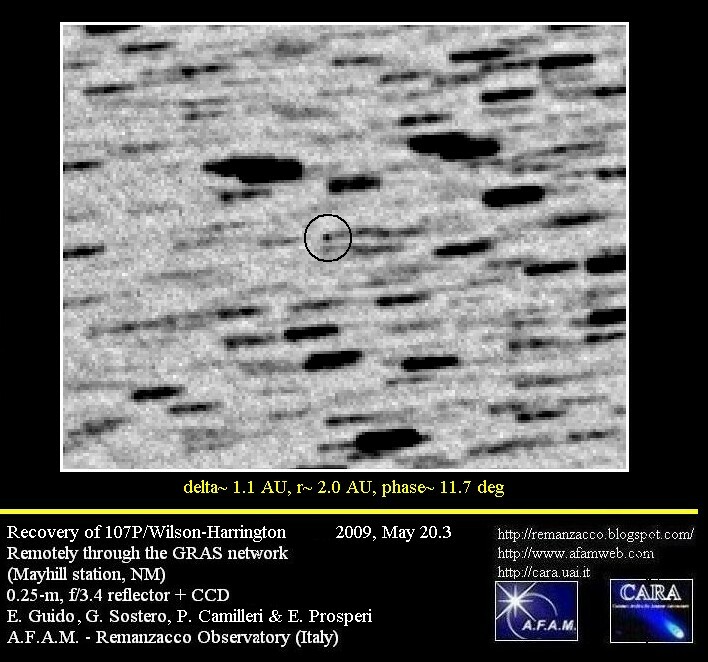 Follow-up after its posting in the NEO-CP webpage was secured by several observers (P. Birtwhistle, G. Hug and the undersigneds), who noticed the presence of cometary features (in general, the existence of a small coma, about 10 arcsec in diameter with little or no central condensation, was reported). 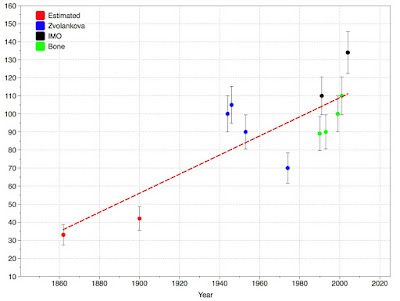 D. Chestnov linked the new designated P/2009 R2 to P/2003 A1 (LINEAR). Probably due to a strong perturbation by Jupiter at the time of its aphelion (Sept. 2006), P/2009 R2 was found significantly off track (nearly 17 deg northeast of P/2003 A1 original ephemerids position). IAUC No. 9073, published shortly after, informed us that B. G. Marsden successfully linked 14 astrometric data points collected in 1783 on comet Pigott (1783 W1) with the positions available so far on P/2009 R2 & P/2003 A1, establishing then that comet Pigott (1783 W1) had the same identity of P/2009 R2 & P/2003 A1. 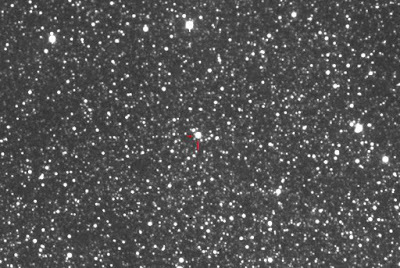 Thus this object has been named as P/2009 R2 (PIGOTT-LINEAR-KOWALSKI). M.P.E.C. 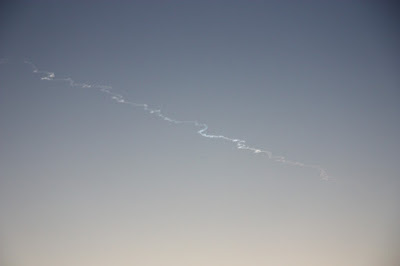 2009-R40, published on 2009, Sept. 11, details orbital solutions and preliminary ephemerid. At first we imaged this object remotely, on Sept. 11.4, through the RAS network (MPC# H06, Mayhill, NM) with a 0.25-m, f/3.4 reflector + CCD: co-adding of 10 unfiltered exposures, 120-seconds each showed that this object was diffuse, without a clear central condensation (this created us some troubles establishing a useful photocenter for astrometrical purposes). 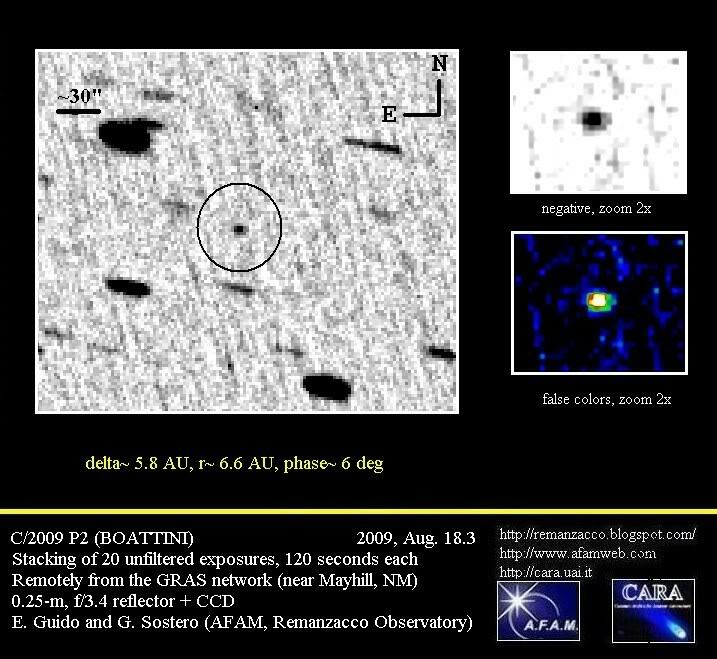 Glare from a nearby field star prevented us to firmly establish a precise coma diameter, however in our images we saw at least 10 arcsec of coma. 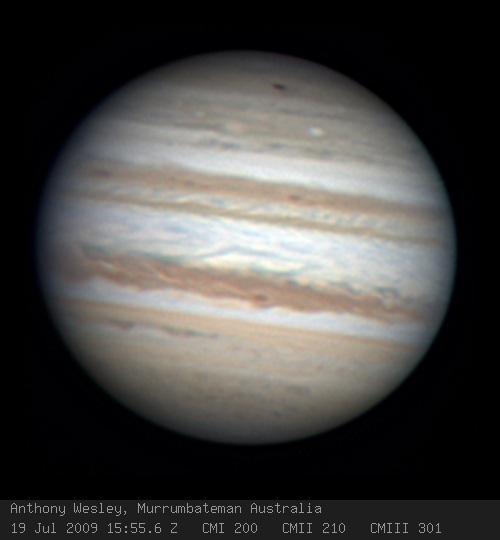 Then we performed some additional follow-up on on 2009, Sept. 13.1, from the Malina River Observatory (MPC# B90, Povoletto, Italy) with a 0.25-m, f/11 reflector + CCD: stacking of 15 x 120-sec unfiltered exposures, confirmed the presence of a tiny coma, about 12-arcsec in diameter, with an extremely weak central condensation (40% illuminated Moon about 26-deg away). IAU Circular nr.9071, issued on 2009, Sep. 10, announces the discovery of a new comet by R. H. McNaught, named C/2009 R1 (McNAUGHT). 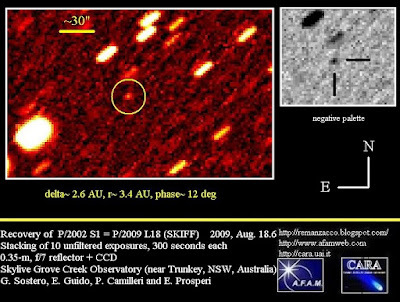 It was found on Sep. 09 in the course of the Siding Spring Survey with the 0.5-m Uppsala Schmidt telescope. 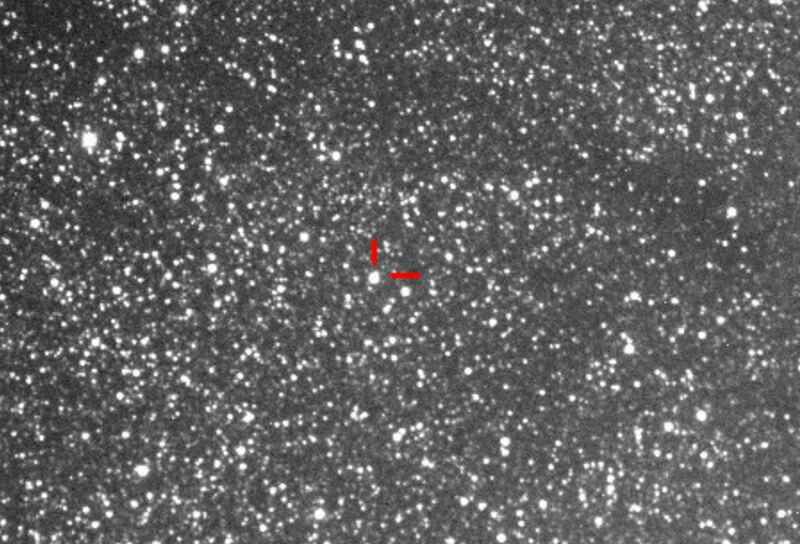 Pre-discovery Uppsala Schmidt images taken by G. J. Garradd and McNaught on July 20, Aug. 1, and 18 have been identified by T. Spahr and B. G. Marsden in astrometry submitted to the Minor Planet Center. 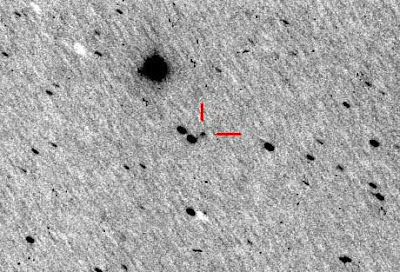 After posting on the Minor Planet Center's 'NEOCP' webpage, other observers have noted the cometary appearance of this 17.5 magnitude object. We have been able to confirm this object remotely, through the GRAS network, using a scope located in Mayhill (NM): on 2009, September 10.2, co-adding of 20 unfiltered exposures, 120 seconds each, obtained by means of a 0.25-m, f/3.4 reflector + CCD, show a coma of diameter about 12" with a hint of elongation toward p.a. 65 deg. 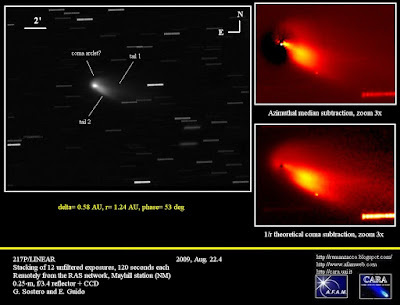 This comet may reach magnitude 5 at the end of June 2010, but the elongation will be very small (only 18 degree on June 27, 2010) and so the observing conditions. 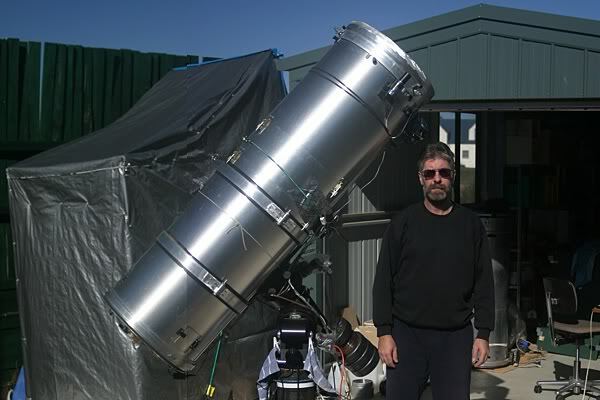 This is the comet discovery number 51 for Robert McNaught. From what is possible to see from the above images, we might bracket the rise of the event between Aug. 20 and Aug. 21. It had a rather quick evolution (matter of hours) and then it settled down in some days. We would exclude a foreshortening effect. 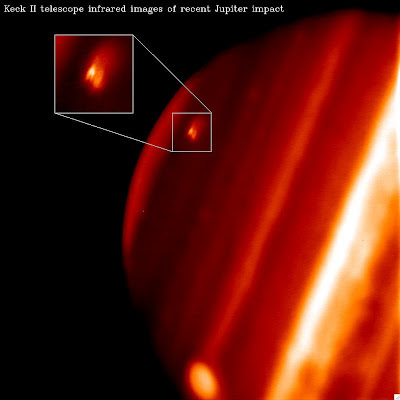 In our opinion we have witnessed a transient phenomena that has interested the nucleus of the comets and/or its surroundings for a relatively short time. Currently (i.e. 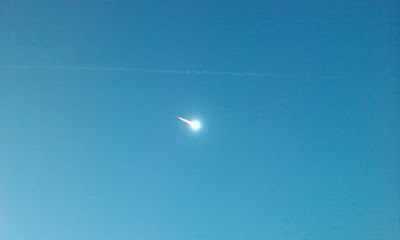 after a couple of weeks from the event) the comet seems to have recevered to its pre-something occurence. We are grateful with the authors of the images. 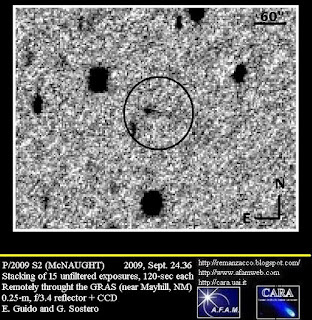 IAU Circular nr.9070, issued on 2009, Sep. 01, announces the discovery of a new comet by R. H. McNaught, named C/2009 Q5 (McNAUGHT). It was found on Aug. 31 in the course of the Siding Spring Survey with the 0.5-m Uppsala Schmidt telescope. 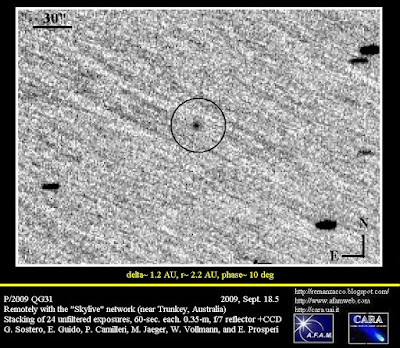 After posting on the Minor Planet Center's 'NEOCP' webpage, other observers have noted the cometary appearance of this 17magnitude object. 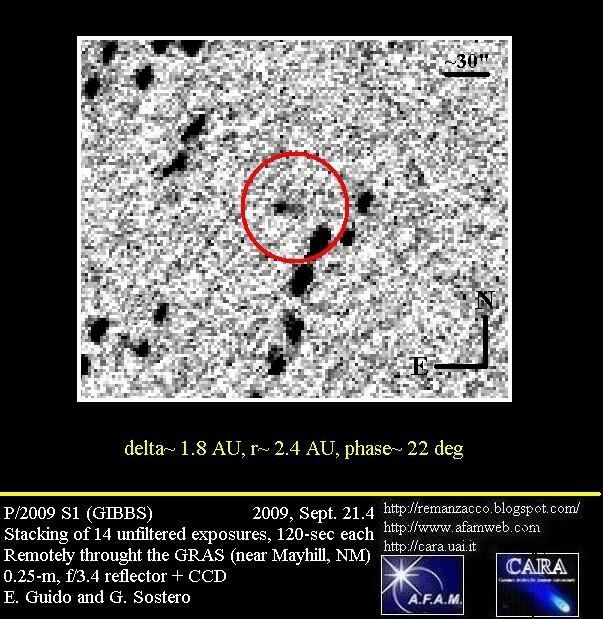 We have been able to confirm this object remotely, through the GRAS network, using a scope located in Mayhill (NM): on 2009, September 01.3, co-adding of 15 unfiltered exposures, 120 seconds each, obtained by means of a 0.25-m, f/3.4 reflector + CCD, shown a compact coma about 12 arcmin in diameter and a broad tail nearly 20" long in p.a. 255 deg. This is the 50th comet discovery for Robert McNaught. Congratulations to Rob for this great achievement. IAU Circular nr.9069, issued on 2009, Aug. 31, announces the discovery of a new comet by A. Boattini, named C/2009 Q4 (BOATTINI). 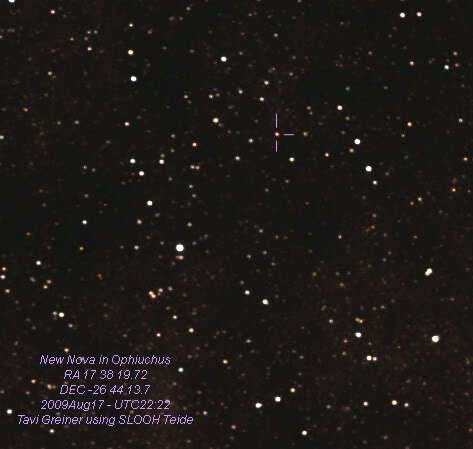 It was found on Aug. 26 in the course of the Catalina Sky Survey with the 0.68-m Schmidt telescope. Magnitude at the discovery 18.9. 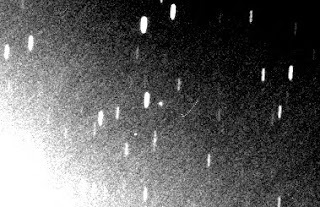 This is comet discovery number 10 for Andrea Boattini.